Marquette, Mich. is an attractive city in many respects. It sits on a series of hills overlooking a beautiful stretch of Lake Superior, there are many lovely historic buildings and the residents love to be active outdoors. Even on a chilly, windy day, people were out in force on bicycles, or on foot, taking the steep hills in stride. Out in the bays, people enjoy summer activities such as standup paddleboarding, kayaking, canoeing, and sailing. Of course, winter sports, such as downhill skiiing, snowboarding and cross country skiing are also popular. But the truly impressive sports facility to behold is The Superior Dome, which I noticed as we drove into town along scenic Lakeshore Boulevard. Home to the Northern Michigan University Wildcat football, soccer and track teams, this impressive structure, which can be seen from long distances away, stands 14 stories high and encompasses 5.1 acres under its roof. Constructed in 1991, it was built using 781 Douglas Fir beams and 108.5 miles of fir decking. It has a permanent seating capacity of 8,000, and can hold as many as 16,000 people. It’s listed in the “Book of World Records – 2010,” as the fifth-largest dome structure in the world and was built to handle the wild winters of the far north, with the ability to withstand 60 pounds per square foot of snow and 80-mile-per-hour winds. 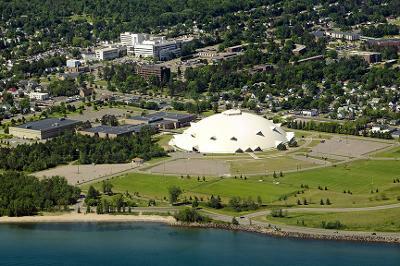 In addition to hosting NMU sports, it is a U.S. Olympic Training Site for Greco-Roman wrestling and weightlifting and hosts a range of club sports and youth sports camps.